George Rush. Untitled (Man, Dog, Still Life) 2016. Acrylic and printed, cut, and pasted paper, 18 x 23 in. Eric Forstmann. He Kettle, 2016. Oil on board, 10 ½ x 12 ½ in. Richard Pasquarelli. Barry No. 1, 2016. Watercolor on paper (16 paintings, 8 ¼ x 10 ½ ea), 33 1/2 x 43 1/2 in. Ann Toebbe. Area Rugs and Placemats, 2015. Gouache, paper, pencil on panel, 20 x 28 in. Tami Bahat. The Feline, 2017. Archival pigment print, ed 1/10, 12 x 18 in. Tami Bahat. The Fishmonger, 2015. Archival pigment print, ed 2/10, 14.5 x 12.5 in. George Rush. Windows and Curtains (Pink & Green). 2016. Acrylic and pumice on canvas, 50 x 68 in. Eric Forstmann. Deconstructed Still Life, 2017. Oil on board, 28 1/2 x 20 1/2 in. Christopher Rauschenberg. Collector’s House, Houston. 2016. Archival pigment ink on Epson Premium Glossy paper, 33 x 22 in. Christopher Rauschenberg. Collector’s House, Washington, DC. 2016. Archival pigment ink on Epson Premium Glossy paper, 33 x 22 in. Ann Toebbe. John’s Two TVs. 2016. Gouache on panel, 20 x 18 in. Bin Feng. The American Dream – Scriptorium, 2015. Archival pigment print, ed 4/10, 40 x 60 in. Eric Forstmann. Committee, 2014. Oil on board, 44 x 38 in. Richard Pasquarelli. Block 5, Lot 17, 2015. Oil on linen, 18 x 24 in. Tami Bahat. The Nun, 2015. Archival pigment print, ed 2/10, 22 x 18 in. Bin Feng. The American Dream – Christ’s Mass, 2016. Archival pigment print, ed 2/10, 40 x 60 in. Eric Forstmann. November Conversation, 2014. Oil on board, 60 x 45 in. Richard Pasquarelli. Sara No. 1, 2016. Oil on linen, 42 x 56 in. Barry Levinson. Untitled (Dead Ego), 2017. Archival pigment print, 22 x 33 in. Gregory Crewdson. Production Still B (Beneath the Roses), 2005. Vintage C-print, 16 x 11 in. Laurie Simmons. Kaliedescope House #9, 2000. Digital flex print, 20 x 16 in. Formento and Formento. Mai I, Arashyama, Japan, 2013. Archival pigment print, ed. 1/12, 30 x 40 in. Robert Rauschenberg. Study for Chinese Summerhall (Pink Flower Sheet), 1983. C Print, 24 x 20 in. 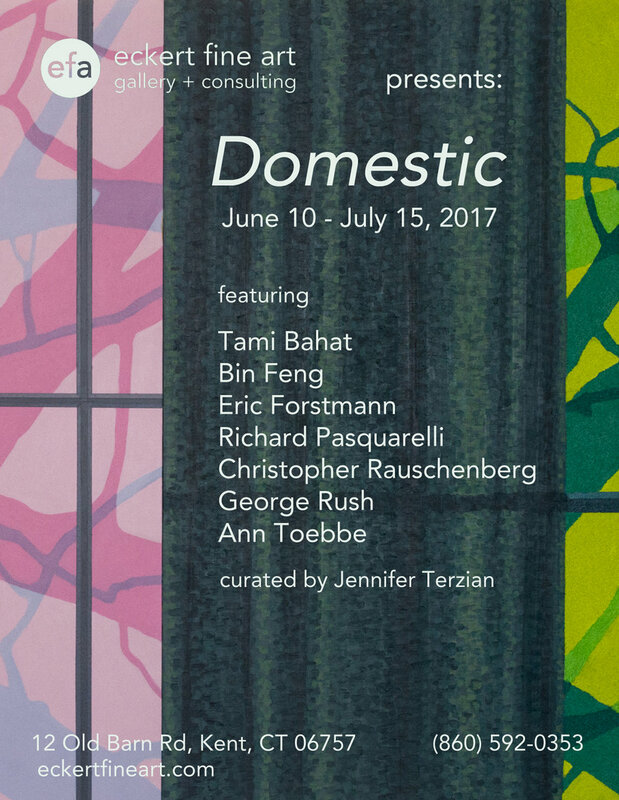 Eckert Fine Art is pleased to present Domestic, a group show curated by Jennifer Terzian. The opening will be held from 4-7pm on Saturday, June 10th at 12 Old Barn Road in Kent, Connecticut. The gallery is located in the Kent Barns art district. This exhibition looks at artists’ explorations of themes relating to interior and exterior spaces, and how objects and personal belongings within the privacy of the home reveal stories, secrets, memories, and demons. Featured artists in this exhibition are Tami Bahat, Bin Feng, Eric Forstmann, Richard Pasquarelli, Christopher Rauschenberg, George Rush, and Ann Toebbe. This theme of voyeurism is prevalent in photographer Tami Bahat’s series Dramatis Personae. Bahat captures her own sense of displacement, of not fitting in with her environment, as she takes refuge with her subjects, citizens of a lost place, long forgotten. Depicted in dark, empty spaces, the characters in her photographs are like an homage to the old masters when artists used light and raw emotion to tell a story. The antique frames Bahat uses for her photographs act as a barrier, protecting her subjects and providing them with a sense of security from the peering eyes of the viewer. Artist Ann Toebbe takes the opposite approach. Her paintings of domestic interiors are turned inside out, and every nook and cranny is crafted with such detail and precision. We are invited inside to look, to meander through the memories and the stories; these rooms are open to us. The absence of a person inhabiting these spaces only makes us want to learn more. 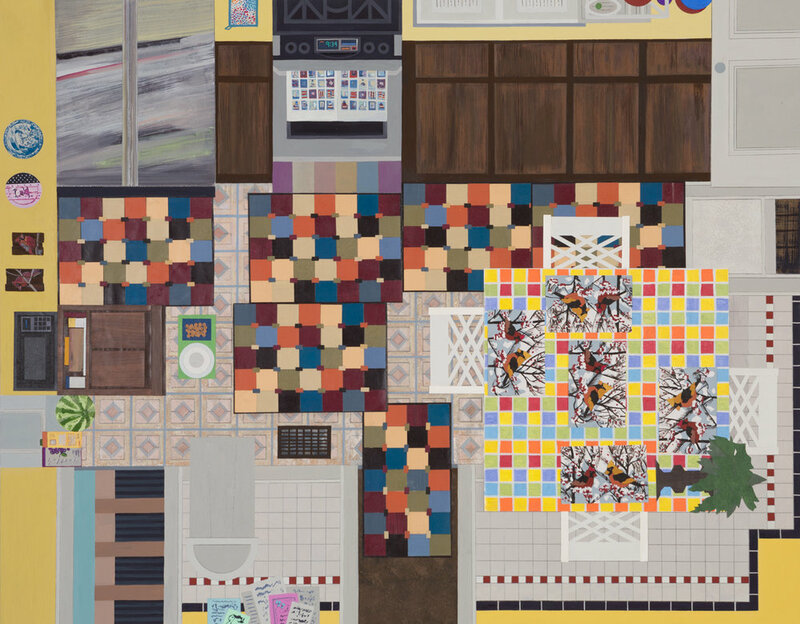 In her painting Area Rugs and Placemats, the meticulous and organized objects are our only clues about who might live there. Toebbe’s personal narrative weaves through all of her work, the sense of nostalgia she conveys is contagious, and we are left with a feeling of familiarity as if we’ve been to these rooms before. Photographer Christopher Rauschenberg’s fragmented images of collector’s homes offer us a glimpse of a life less ordinary. 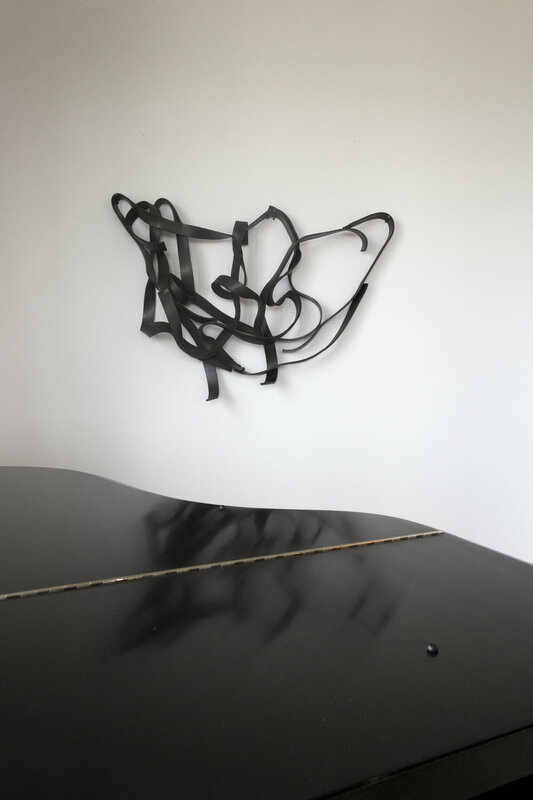 His perspective provides us with a very small piece of information – in Collector’s Home, Houston a bright yellow Rothko painting peers behind a vase of flowers, alluding to the subject’s imminent wealth and status; another photograph shows the top of what looks like a baby grand piano with an expensive wall sculpture hanging above it. Rauschenberg treats these domestic spaces with fragility and patience, he is in no rush, nor needs to reveal anything more than what the photograph exposes. Instead, the viewers create their own conclusions. Bin Feng’s photographs further our curiosity to learn more about the characters who inhabit the domestic scenarios he stages. Born in Shanghai, China, Feng’s fascination with the “American Dream” comes to life in his photographs. Feng provides the point of view of the Eastern male by including himself as the protagonist. Any atmosphere of a peaceful, harmonious domesticity has long vanished, and Feng becomes the victim of overachieving. These carefully constructed tableaus emphasize the void of reality that is a symptom of our modern society. George Rush paints what is familiar but leaves the rest of the story up to the viewer. 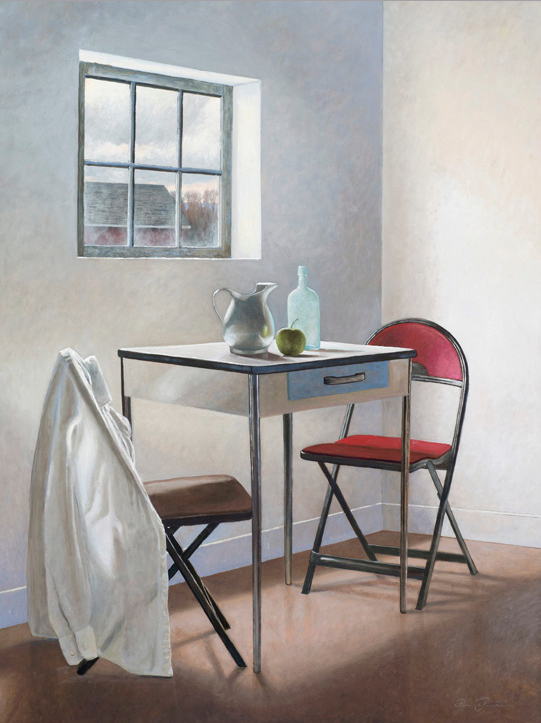 His paintings of domestic settings are fragments of an experience; Rush is able to manipulate the scene through an abstraction vs. representational technique that plays with the viewers’ perception. An illusion of recognizable objects exists, but without visible connections or sufficient details, we are left with only suppositions. His interest in the absence of privacy and how we must renegotiate our relationship with this loss is at the crux of his work. 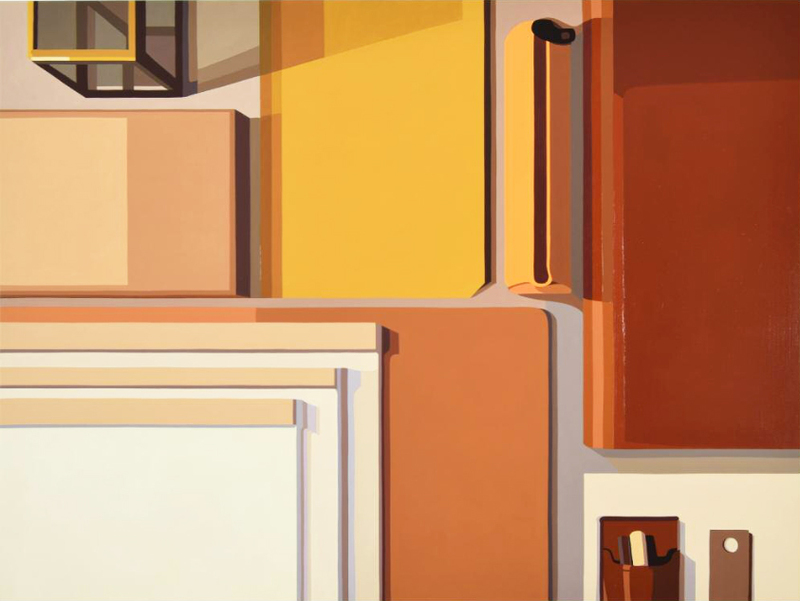 Realizing the possibility of purpose or meaning in the mundane objects that surround us inside our domestic settings is a reoccurring theme in Eric Forstmann’s paintings. The items he so meticulously portrays via his expertly handled Realist technique causes us to pause and take notice; no matter how insignificant these “things” are, we are confronted by the histories they suggest. In his painting titled Committee, the complex crescendo of stacked chairs conveys a sense of organized chaos; whoever inhabits this space must maneuver cautiously and slowly. Since receiving a degree in Art History from the University of California Los Angeles, followed by a Masters Degree in Contemporary Art from the Sotheby’s Institute in London, Jennifer has been involved with numerous aspects of the contemporary art world. She spent five years as Director of Marc Selwyn Fine Art in Los Angeles. Prior to working for Marc Selwyn Fine Art, Jennifer was assistant director at Peter Fetterman Gallery and was assistant to the owners of Los Angeles Modern Auctions. She also spent time on the Board of the MOCA Los Angeles Contemporaries. Jennifer is currently on the Board of the Northwest Connecticut Arts Council.